The Center for Watershed Sciences is investigating harvested rice fields as potential salmon nurseries that could help boost struggling Central Valley populations. 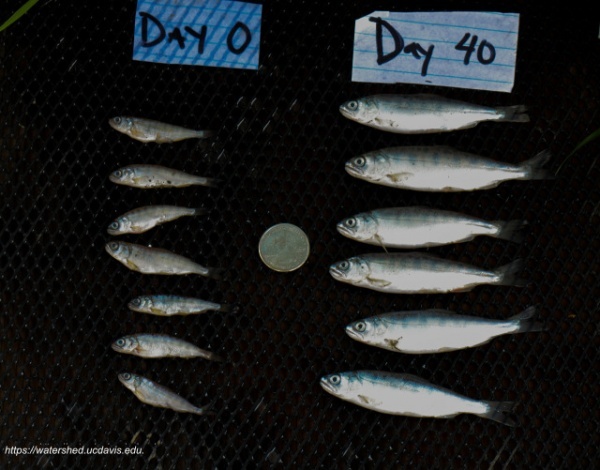 Experimental releases of young hatchery salmon on the Yolo Bypass near Sacramento indicate that parts of the 57,000-acre floodway could make productive rearing habitat at relatively little cost to farmers. Juveniles in flooded rice fields grew much faster and bigger than those released in the Sacramento River. Bigger juveniles survive better when they reach the ocean and are more likely to return as spawning adults. The Center has been conducting the experiments since 2011 with a consortium of landowners, conservation groups and public agencies. The project takes its name after a Japanese form of sushi that has a slice of fish atop a compressed wedge of vinegared rice. This UC Davis video, above, shows researchers tagging and releasing juvenile salmon on test fields in February 2013.